This entry was posted in Adventures in Los Angeles, Consumerism, Fun & Humor and tagged Fun, Human behavior, Party City, Rants by unknowncystic. Bookmark the permalink. I agree with you about the receipts, I guess what really winds me up is all the offers they print on them for stock that no one has ever or will ever buy! If your talking fish & chips there is only one combination worth considering and that is haddock & chips with mushy peas and plenty of salt & vinegar on it. When you visit you’ll see what I mean. After all Grimsby was once the busiest fishing port in the world. Sorry to break it to you, but my daughter and I like the Halibut better than the Haddock. It’s not that we don’t like Haddock, but it’s not as good. I don’t like peas either. Regarding the receipts, I agree that they usually have information on them I’m not interested in. Hope you and the girls are doing well. Why are you always sleeping in the photos posted on Facebook? BTW, I’m going to give my wife your email. My daughter wants to visit England one day and I’d like her to meet you and the girls. Just in case I’m not around I want my wife to know how to reach you. And perhaps I’ll have her visit our Friend in southern England too. But you’re a must visit for her. 2) This conversation with seanset leads me to believe that a) you are on facebook, which I thought you didn’t like and b) someone knows your identity. Fascinating. I am on Facebook, but not on Facebook. I look at it once a month. I can live without it. Mostly, it contains photos of Sir Sean sleeping on a couch. Stuff like that. It really doesn’t get more exciting. BTW, there are no pictures of me there. I fully agree with being annoyed by long receipts. It happens every time I grocery shop… and I don’t buy that many things at the same time. I am also annoyed when they hand me the super long reciept AND like 3 or 4 printed coupons. Save paper people! I agree: save paper. 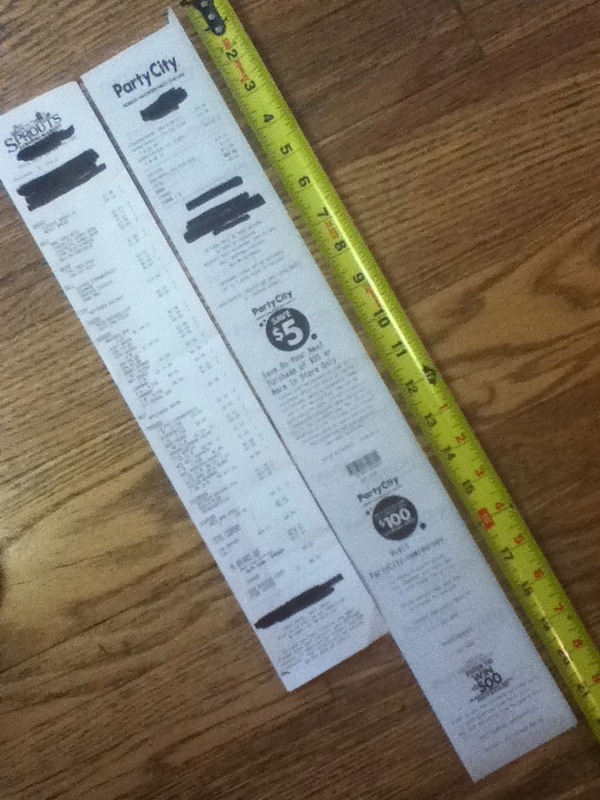 Glad I’m not the only one thinking this when it comes to super-long receipts. Thanks for the visit and comment. Much appreciated. We like mad you, provides the rest of us with many, many moments of amusement!